Don's birthday gift was just delivered. A nice gesture, but he may go broke trying to maintain it, if he decides to keep it. Definitely not the best or easiest of cars to drive or work on. He may also want to keep a bit of spare cash aside in order to pay for the physio he'll probably need due to the heavy steering and shifting. Personally, I often wondered why such cars carry such a high, or should I say absurd price tags. A valid point, Patrick. Maybe we should give him a more practical gift that he might use ............. like a new RV? He could choose one from this collection. 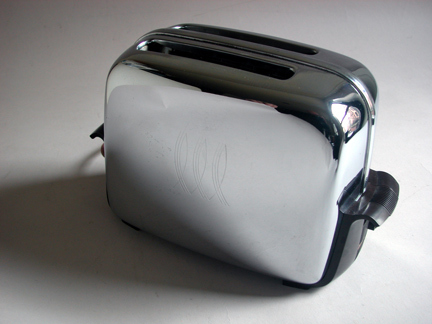 Or, I guess we could give him what we gave him last year -- a new toaster. My birthday is still 71 days away???? Yes, we know, but it is never too soon to start looking for your birthday gift. Time to call it a night. Luckily, the thunder and lightening are no more. Should be able to get some longer sleep. We shall see. Paix, mes amis. Morning all, things are back to normal after having company from Calgary from Friday to Monday, so SAP is up for the day. Election day in Alberta will give us reason to celebrate this evening, a kid checks out dog poo and our video on how Big Ben keeps accurate time are featured today. "Kid Checks Out Dog Poo!" That 1951 Buick LeSabre is quite the design. Location: Windsor, gateway to the world, but I can't find the damn key! From what I read about the advance polls and the huge voter turnout in Alberta, do you think there are very many left of those that are eligible to get out and vote today, the actual voting day?? I guess they don't use centralized voting machines that would help for those who were able to vote out of their actual registered voting locations. Last edited by pm-r; Apr 16th, 2019 at 01:16 PM.